We are discussing the use of aquaponics in desert areas where materials are scarce. Has anyone experimented with using sand as a grow bed media? Pea gravel and any commercial media would not be practical. I think it stay wet and can become anaerobic(spelling) I would look at NFT or DWC. Theres a thread on floating rafts you might find interesting. DWC or NFT are the way to do. Perhaps you can use the sand as part of your solids removal regime. It will cause problems if you use it as a grow media as obo says. Google 'uvi aquaponics' and go from there. The media used should be course. I use 20mm (3/4") gravel. The finer the medium the more likely it is that you will have blockages. The only way to avoid the blockages would be to put the water from the fish tank through a pre filter to remove as much of the solids as possible before the nutrient rich water goes to the actual grow beds. In home systems the idea is to make them as simple as possible to keep maintenance low and reliability high. The gravel grow bed is the simple and reliable answer to that. Sand, even course sand will give blockage problems very early. I'm a newbie or maybe even a pre-newbie , but I've been downloading every resource I can find to try to learn more. Attached is one I found that is an updated manual from an early University research project into aquaponics where they started out using sand and then, just like everyone is saying, it talks about going to better media. Murray, would something like broken up pottery work in a situation where you couldn't get supplies? The suitability of sand as a growing media depends entirely on the watering regime in use. Sand is used as an hydroponic media so it can (with the appropriate watering program) be used for aquaponics. Having said that, gravel is probably a better choice for those who are attracted to the flood and drain grow bed model. would something like broken up pottery work in a situation where you couldn't get supplies? Some on this forum have used broken up clay bricks and the like with good results, after all, clay pebbles are widely used around the world in both hydroponics and aquaponics. The only problem may be the labour needed to break up the old pottery to suitable average size. I assume the pottery is clay in its origin ? Concrete type pottery may give a pH problem depending on how old it is and it's particular make up. Sand is used as an hydroponic media so it can (with the appropriate watering program) be used for aquaponics. Sand grow beds could be used if you had some kind of pre filter to remove the solids in a given system, perhaps one grow bed using the broken up pottery as the solids filter, then take the water from that to feed through a number of sand based grow beds. You would enjoy good plant growth provided you did not allow the sand to become clogged with solids and become anaerobic. It would just require a bit more maintenance than a regular course gravel grow bed. Perhaps you should consider a floating raft system as an alternative if suitable grow media is not readily available in your area. What about using sand for wet rice production? A friend told me of a system in Java where they make make some sort of compost tea. The rice had some pretty good yields. He didnt know what sorta tea and this is pumped our to the rice beds which had sand as a growing medium. To my limited understanding most if not all the wet rice is grown an anaerobic. The soil doesnt really recover to aerobic during its short fallow period. But as I say dont quote me on this. This information is great - keep it coming! What we are looking for is a practical way to bring Aquaponics to an isolated refugee camp in the desert of North Africa. Everything they eat and drink is shipped into them. They are trying to garden, but very little yield. The ideas and suggestion shared so far are a tremenous help as we think through this possible solution. thanks - looking forward to hearing more! I'm located only an hour drive from the Arkansas rice bowl region. They flood the fields in the spring but the rice grows very much like wheat or any other grain with regular rainfall and the soil is very sandy with plenty silt in it. Mississippi bottom land is what comprises most of the soil there. Using sand and compost tea is not a bad idea if you're not using the aquaponic method. Compost tea can be made simply from any compost heap that's finished off and no longer hot. Standard container gardening with sand, compost tea and adequate drainage will work for rice. I have seen corn growing in AP grow beds in thumbnails on this site. Corn is a nitrogen hog whereas rice isn't quite so much. In gravel, like Murray described, I would think the results would be excellent. If bringing in gravel is cost prohibitive, get some 1/4" hardware cloth and put everyone to work sifting gravel out of the local sandy soil and use it as your grow media. It will have various sizes so you may want to put the gravel through other sized screening to sort it according to the size you desire. It's a great blessing to help others grow their own food, but it's even more of a blessing to them if they have to work for it. Sweat of the brow is where the victory over starvation is conquered, not through handouts and free lunches. (19) In the sweat of thy face shalt thou eat bread, till thou return unto the ground; for out of it wast thou taken: for dust thou art, and unto dust shalt thou return." See, no plow mentioned and the lack of weeds in an aquaponic bed is the secondary blessing because it isn't the ground. God doesn't say we can't be creative thinkers and figure out a better way, you just can't avoid the sweating part. Work smart, not hard; it's not just a hat rack; plan ahead and all that sort, as my dad always used to say. Google NCA&T state university aquaponics research .pdf Their early stuff was done with sand grow beds and extra biologic/solids filtering. The pdf is too large or I would just upload it. It is called aquaponics.pdf which was originally in printed form by the cooperative program. Also as a way over the top posibility, I know they probably don't get rain, but do they get lightning? If they do then metal rods jabbed down into the top of a high sand dune can make fulgarites or lightning glass. These are lumpy gravel like shapes that might make good growing media. Its about as sterile as it gets since it was heated to many thousands of degrees, has plenty of surface area for bacteria and wouldn't compact so that air could get to the roots. Hope the top one helps, mostly mentioned the second just because it crossed my mind and I don't know why it wouldn't. The current (May/June) Hydroponics and Greenhouses mag has a good write up on a large commercial recirculating hydroponics system that uses sand as the medium. Coarse bedding sand with a couple of sieve type filters inside the AP grow bed media filter might be worth trying. Hydroponics can and do use sand, the difference is that hydroponics systems do not have the fish solids to deal with. The discussion is becoming circular.......we've covered the fact that the solids should be removed from aquaponics system dozens of times. James Rakocy said it.......Nick Savidov said it.....Wilson Lennard said it here.....and here......and I've been saying for as long as I've been involved with aquaponics.......the solids should be be removed regardless of the growing system. Why?......because it's in the best interests of the fish.....end of story. The notion that aquaponics is somehow different (in this respect) to aquaculture is pop-science and one the prevailing great myths of aquaponics......and is probably responsible for the premature deaths of many thousands of fish. The removed solids can (and should) be mineralised so that the nutrients can be put back into the system. Being an island guy, when I think of sand the beach comes to mind. I am sure the added salt and minerals could help with the system, but drastic ph changes would have me worried. I know I have had bad luck adding washed sand to aquariums. The thing that people often confused is that they think all the sand in this world are the same. Desert sand are actually very fine, too fine to be much use. During the construction of the artificial islands in Dubai they take the sand from the bottom of the sea. The fine desert sands are too unstable. 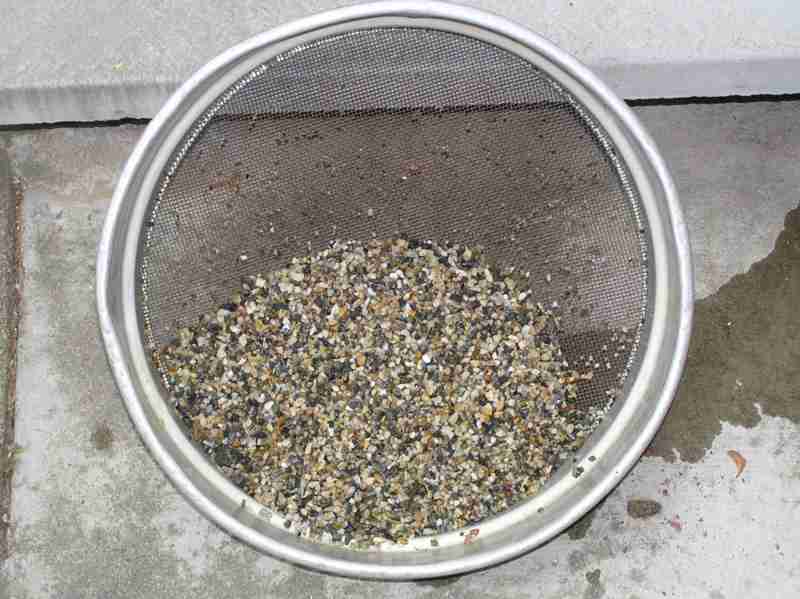 In aquaponics, I believe desert sand could easily become clogged and it could be easily wash away and could disrupt your pump and piping system. Else, any coarser type of sand might work. The thing that people often confused is that they think all the sand in this world are the same. I remember first starting out, trying to get my head around filtration and asking the same question about sand. I received the same types of answers from people knowledgeable in aquaponics and they gave me the same types of anwsers as seen above.They answered according to what they knew. The sand question never disappeared, for instance, sand used to be commonly used in pool filters, but I/we did not know differently about applying it to aquaponics. Personally and currently I am looking at iVAs using the information (which was only recently readily available) to do exactly what I did when building my gravel flood and drain system. The thing I have learned recently about using sand is, I think the most imoprtant thing is to spend the time finding and selecting the correct sand. The type of sand and this key. Getting the correct sand was never explained to me previously. When I find the correct sand and have it in my growbeds and I get the fish I want, I envisage learning many things about using sand, quickly. There are quite a few people on this forum trialling it now and as far as I'm aware, so far it seems to be very good. Great fun looking down memory lane some times some things changes after all I guess at least for some of us, that is. What amazes me is that iAVs (and the use of sand) eluded us for so long. When it was finally pointed out to me, I can recall thinking that it had been 'hidden in plain sight' the whole time. I've asked myself why I never followed up Mark's work earlier...many times. The only answer that I can come up has to do with the Steve Diver ATTRA article that we all relied on so heavily back in the early days. You can't help feeling, when reading Diver's cameo pieces on the main systems that were around back in 2001 (when the article was first published), that the Speraneos somehow 'improved' on iAVs....when the reverse was the case. The document also incorrectly stated that iAVs employed trickle (drip) irrigation...which is a poor description of what is actually a reciprocating bio-filter on an intermittent irrigation regime. I'm certain that there were people who understood how iAVs worked but were not interested in drawing attention to it...for their own reasons. I'm aware that Mark reached out to Rakocy who was allegedly involved in aquaponics 'research'...and Nelson and Pade...but they never (so it seems) uttered a public word about it. For the rest of us it was probably the assumption that, since it had been overtaken by the Speraneo model (who themselves did little to draw attention to the fact that their 'model' was a direct flop of iAVS....save the key question of media particle size) there was little to be gained from going backwards. I think it suited everybody with a vested interest in those days (early 2000's) for McMurtry to retire broke (financially and physically) to his Montana mountain top. I find myself wondering what might have happened had he been capable of persisting with iAVs back in those days. One thing is certain, the thousands of fish that perished in malfunctioning Speraneo systems would have no doubt been grateful... as would the thousands of impoverished villagers who might have survived longer than they did...and the countless arguments about what was a useful commercial model (and what was not) would have been resolved. We would, in effect, have been 20 years ahead of where we are now. I know this post is old but I just wanted to say I'm doing really well with sand in my little aquaponics system over a bathtub with fish. I don't use a pre-filter. I started with 4 standard (in Australia) seed planting trays with a chux cloth in the bottom to stop the about 50mm deep of sand falling through and two containers making up the same size area as the sand beds containing about 300mm deep of scoria. a pump takes the water out of the bathtub and distributes it through 32 little 3mm fittings to evenly disperse the water across the media in a continuous flow. there are 10 juvenile Jade perch and some feeder fish in the bathtub plus a catfish to keep the algae at bay. The sand side outperformed the scoria side by leaps and bounds. The plants in sand were a lot more productive and when I dismantled the system and compared the root systems it was obvious why. The plants love the added support and probably some sort of mineral supplement they get from the sand and their root systems went nuts. I've just re-jigged the system so it's all sand with fresh plants in all of it. The plan is to change one seed tray every fortnight empty out the old plants, wash the sand and put the water from the wash on the garden. For my bigger system I'm using the triple sump system to remove all solids before it reaches the media bed. I'm going to do a compare trial of sand versus scoria in that one too. Scoria already outperformed clay balls in a previous test. Hopefully the triple sump will negate the need to wash the sand as this will be impractical in a larger grow bed. This comment peaked my interest... " The removed solids can (and should) be mineralised so that the nutrients can be put back into the system"
Is anyone able to explain how that works? Have a look at the iVAs threads,mainly found in the aquaponics section of APN, along with the iVAs facebook site.There is also a lot of papers in this forum to show some of the works of Mark McMurtry. The selection of the correct type of sand is very important in a iAVs system The ideal sand is quartz silica sharp and a particular size range. You will need to rummage through some of the iAVs threads and the iAVs site to find the exact size range. The iAVs uses the nutrients and solids to help in the beds and feeds the plants so no filtration is required. The particular specification of the sand filters the water effectively. You may want to keep an eye out for this type of sand to replace your current sand, doing this should stop your need to wash your sand regularly. Here's a link to the iAVs site and I'd suggest you also look at the facebook site and the iAVs info at APN. Sand is the most cost effective mechanical and biological filtration media of all...and there'sa growing body of evidence (aside from Dr Mark R McMutry's research) that supports its efficacy as a growing medium. In fact, it seems that the only criticism of sand used in the integrated production of fish and plants comes from people who have never tried it. The sand is the only solids removal process that is required. The Integrated Aqua-Vegeculture System (iAVs), in its most basic form, consists of a fish tank and a sand biofilter. The water is pumped from the fish tank (which is buried in the ground) up to the sand growbed. It percolates down through the sand and exits the sand bed...draining straigth back into the fish tank. If the sand is silt and clay free, there will be no need to wash the sand. The fish solids remain in the furrows where they become part of the soil microbiology that underpins iAVs. I made the comment with reference to coarse media...like gravel, clay pebbles, pumice and scoria....where separate mechanical filtration is essential. With iAVs, there is no need to remove the solids....they become part of the detritus layer and are mineralised in the furrows of the sand biofilter.